I recently painted the Shadespire Stormcast warband for Mike. He wanted black as a primary color but with plenty of gold trim. Traditionally, I’ve struggled a bit with black, often highlighting with grey or dark blue which cause my models to appear…grey or dark blue. These three models were the start of another chance of getting black down because a black based Blood Bowl team looms on my horizon. With this first experiment back in black I had a couple of things working in my favor. 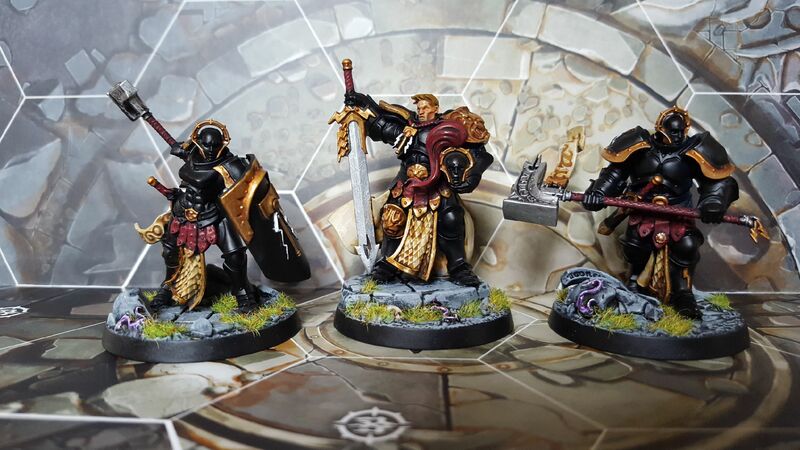 First, we wanted the Stormcast Eternals to look clean and regal. Grey highlights may have dulled their look, IMO. Fortunately, gold was decided as the trim color so it added to their majestic look, but also provided visual breaks in the black so the eye could pick out separations without a need for me to attempt black highlighting. Oh, edge highlighting isn’t something that’s going to be part of my hobby experience. Recently, my hands have become a bit shaky, and I’ve just been check and found to require reading glasses, so fine detail work has the potential to go wrong. Plus, with my paint load, I just can’t commit to all the extra time edge highlighting requires. In the end, the three above looked sharp enough and fine for a handful of models. 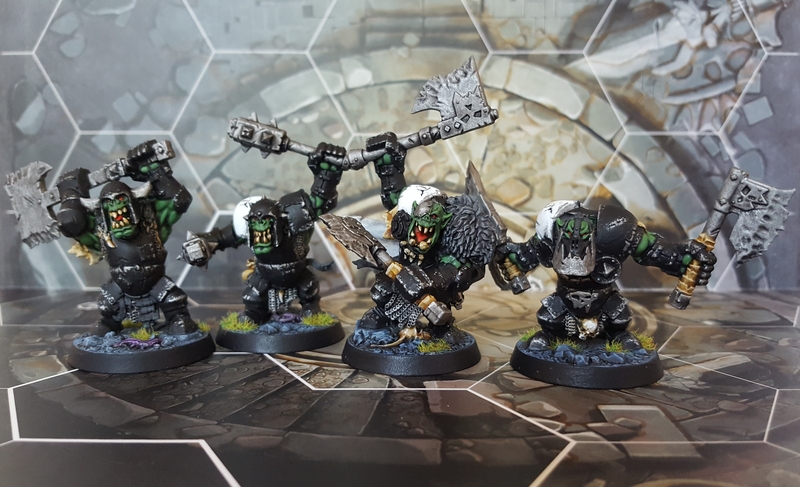 However, my ultimate goal of painting black is going to be for my upcoming Blood Bowl 2016 rendition of my Badlands Blitz orc team. With a field of mostly black models, I knew I was going to need some sort of shading or highlighting trick for black. My usual method of base color -> wash -> base color again won’t work…nor would just simply staying black. 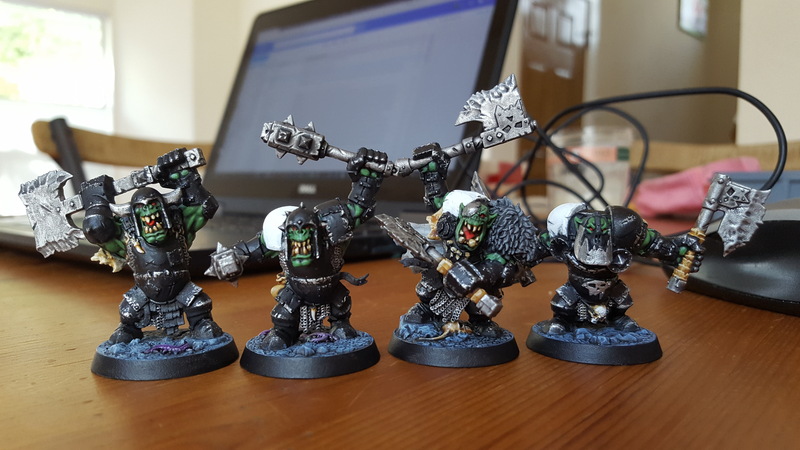 Before I jump on that BB team, I had another chance with few models….the Shadespire orruks (or orcs for the traditionalists). Before painting I did a few slight conversions. Mostly new heads and moving the one-eyed head over to the leader model. Having that BB16 set in the house, I had the Gouged Eye transfers, icons I wouldn’t use for my BB team, so I put them to use here. The leader has lost an eye, gone a bit crazy, so thus Oddeye’z Oddboyz were born. Anyway, back to the black. 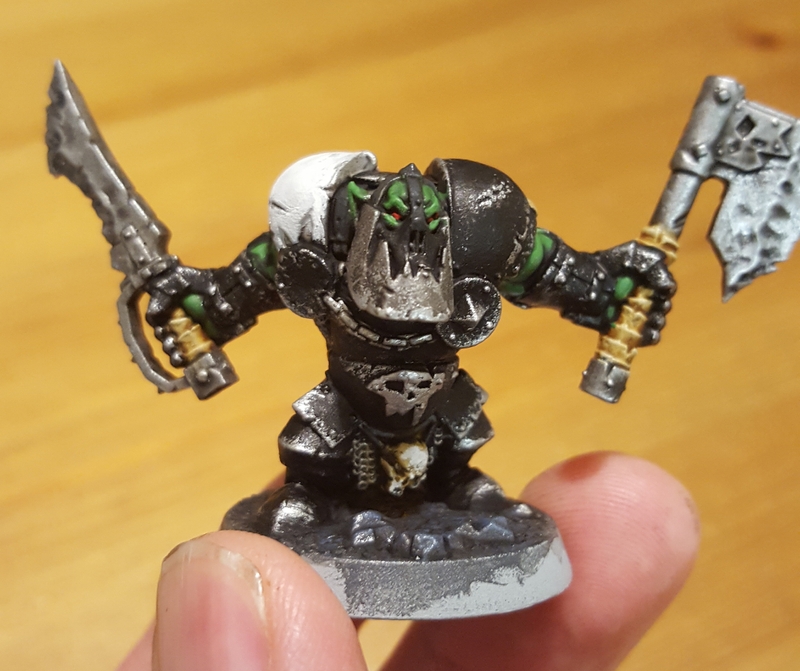 I painted up the orruk with the Bane-like muzzle going all black, but one white shoulderpad for the gouged eye transfer. Again, I didn’t want edge highlighting to be a option, so looked a bit online. I saw many orc models with chipped and damaged armour. This would allow me to put a trim on the edges of the armour, creating that visual separation black requires with highlighting, without me needing to be clean or careful. The first pass of using foam in chainmail colored paint was a bit overkill. It seemed too much. I had to go back and do some clean up with black so the chipping appears mostly on the edges. This didn’t take any time at all, but most importantly didn’t require fine motor skilled, detail work. I could be a little sloppy and no one could tell. Damaged armour isn’t clean. I used the same technique on the white shoulder pads, but it isn’t as pronounced. The lighter base color doesn’t allow that chipped armour to look to ‘pop’ as much, so there still needs to be a little refinement there. I applied those BB Gouged Eye transfers to the pads and ran some gloss over them for two reasons. One, to help fix the transfer to the model over the long run, but two to give something clear for a little paint to stick to. I did some light spots of white on various parts of the transfers, so they look sort of worn and chipped as well. Hard to tell in the pictures, but the end result is pretty good. 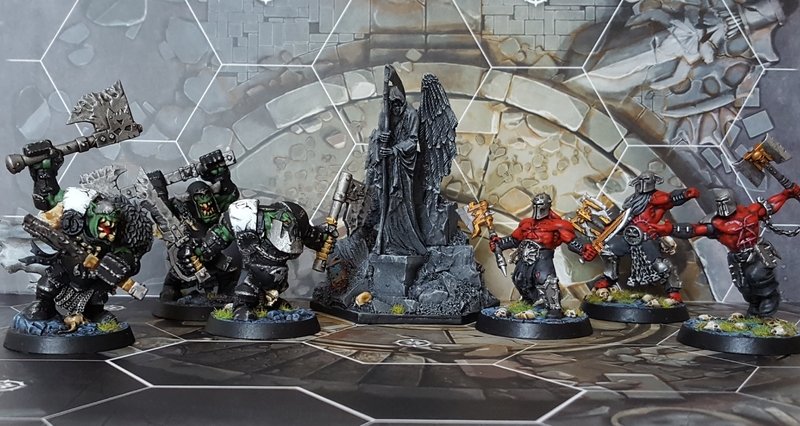 This entry was posted in Conversions, Gaming, Hobby Tips, Shadespire, Warhammer Underworlds and tagged conversion, Games Workshop, Painting, Shadespire, tabletop wargames, Wargaming, Warhammer by Mr. White. Bookmark the permalink.